In the winter I would hear her thrumming nearby. She would seek shelter from the rain on the branch of the cedar tree just outside the window. Raindrops on the roof, a crackling wood stove, and a gentle cooing became the soundtrack to my quiet days in the cabin. In the spring I began to look forward to a morning routine of sipping coffee perched in the window sill, where I would watch the grouse delicately plucking buds from the apple tree. She was methodical and focused as she wobbled on the weaker limbs of the tree, pushing her luck to reach the plump apple buds. It's midsummer now, and yesterday morning right after rising, I stumbled onto the porch to walk half-awake down the trail to the outhouse. My heart leapt into my throat as a thunderous flapping of wings greeted me on the other side of the door. The apple blossom grouse had been resting on the porch. I apologized for startling her as I laughed at my own thumping heart. I was happy to discover the apple-blossom grouse was not only still alive and well, but had become a momma bird to three peeping chicks. 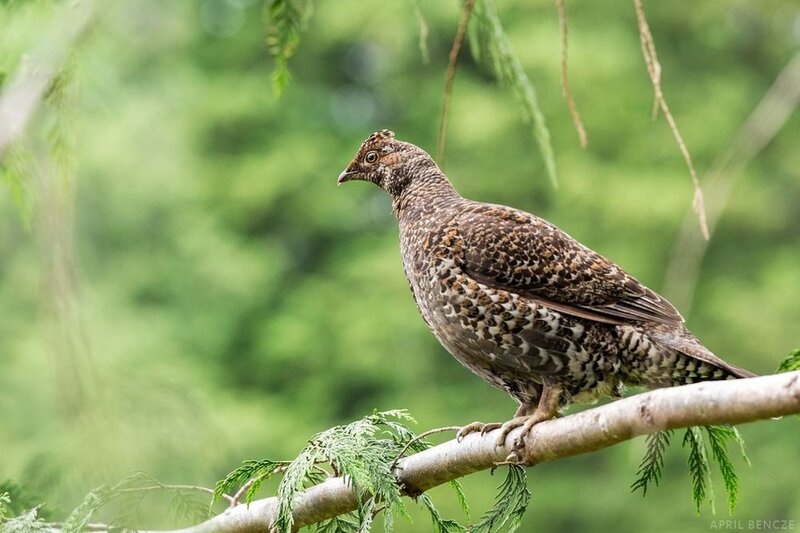 As her young explored the world with a familiar curiosity, momma-grouse flapped noisily up to her perch on the cedar branch outside my window. She stayed there for hours, gently thrumming as I sipped coffee and put pen to paper.